Although the FBI is investigating Hillary Clinton’s handling of sensitive government information on her private email account, she still has security clearance to access classified information, McClatchy reports. National security experts said it’s common practice to remove that clearance during an investigation. 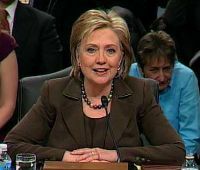 The State Department has revealed that Clinton sent or received at least 200 e-mails containing classified information through her private system. “If this were a normal employee, it would be entirely routine to temporarily suspend their access pending investigation,” said Bradley Moss, a Washington lawyer who handles national security information. Posted: 10/1/15 at 9:00 AM under News Story.